Ed. note: We’d like to introduce Max Smith to TGRR. Finch and I hooped with him at Ball State and found him to be a fellow sneakerhead and hooper that spent a lot of time in the gym. He’s played in tons of different models and will help us bring you guys more content here at TGRR. He knows his stuff too, as you’ll soon find out with his Peak TP1 Performance Review. If you’re unfamiliar with the Peak brand, let’s run through a brief history. Peak was founded in China in 1989, and is one of the leading footwear brands in Asia with over 6,000 stores in China alone. As the brand grew, Peak found its way to the NBA in 2005 by signing a stadium sponsorship deal with the Houston Rockets and signing then-Rocket Shane Battier to its first endorsement deal. 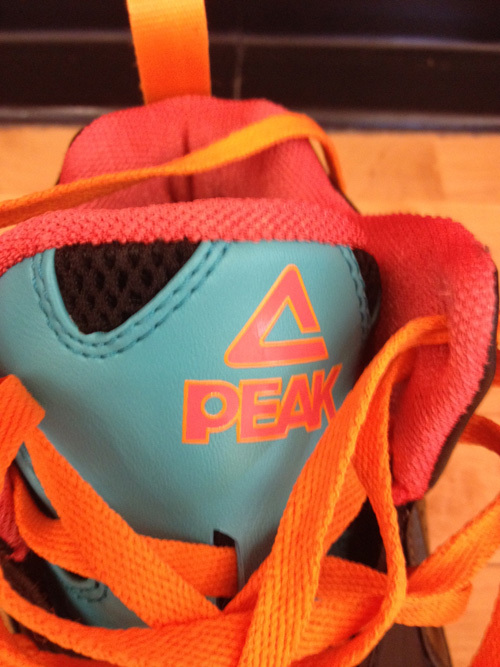 Since then, Peak has increased its U.S. presence with launch of peaksportsusa.com in 2011 and found its way onto the feet of players such as Kyle Lowry, Gordon Hayward, and JaVale McGee. Its most recognizable athlete though, is the Spurs’ Tony Parker, who got his own signature shoe this season: The PeakTP1. If you’ve never seen a Peak shoe in person before, you’re not alone – so I’ll try to break it down for you as much as possible. The upper of the TP1 is synthetic leather, like most shoes on the market, with strategic ventilated areas throughout – similar to Nike’s Hyperfuse or adidas’ SprintWeb technologies. The toe and midfoot fit is a little looser than most shoes on the market, but that’s more indicative of how narrow lasts run nowadays than any knock on the TP1. Containment over the footbed is pretty good, and I didn’t feel any major sliding when I’d change direction. My foot is average in width and there was enough extra room to just make it comfortable – the shoe should accommodate most foot shapes. With ample eyelets that run up the entire length of the upper, heel lockdown was quite good when laced up tightly. There is plenty of interior heel padding as well and your heel shouldn’t be going anywhere. If I could compare it to a more mainstream shoe, the fit felt similar to the adidas Rose 3. If you are a narrow-footer or want a really snug fit, go a half-size down but if you’re unsure go with your true size. Again, it’s difficult to find Peak in physical stores so you’ll likely have to take a chance on sizing. 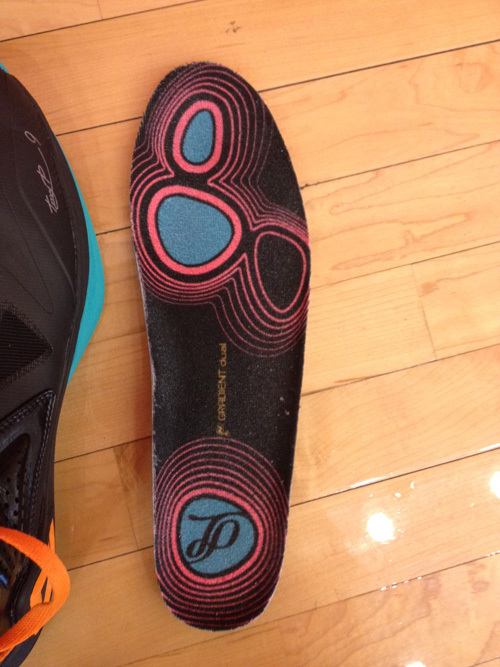 The transition is smooth given the GradientDuo foam midsole (more on this later) and flexible forefoot zone. Foam midsoles typically lend themselves to smoother transition (rather than midsoles with an Air unit or other inserted technology) because of the consistency of the material. I am naturally a midfoot striker so I rarely come down on my heels, and the TP1 was smooth through each step. One thing I would change is the weight of the midsole. It felt significantly heavier than the upper and was noticeable while playing, though I can’t knock it too much. I mentioned GradientDuo before, and it proved to be the perfect mix between soft and firm. The forefoot was a little firmer than the heel, but it was designed that way as they utilize the GradientDuo technology. There are pods in the heel, ball of the foot, and in the big toe that are slightly firmer than other sections in order to improve responsiveness. 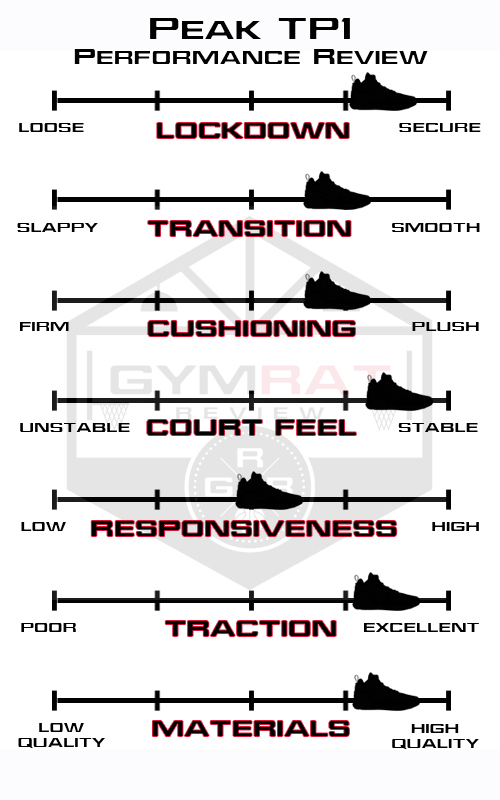 This way of designing the cushioning is similar to what you’ll find with Podulon in the CP3.VI and VII models – think of GradientDuo as a firmer version of Podulon. 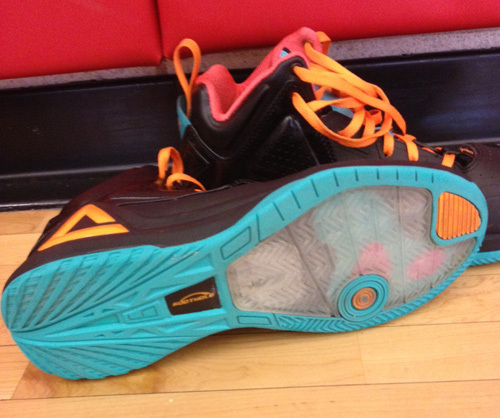 The court feel was excellent as the midsole is thin and flexible, and as a result the stability was also on point. I never experienced any instability during my runs with the shoe – again thanks to a solid midsole setup and a slight lateral outrigger. The shoe lacked the responsiveness of a Micro G or Zoom Air, but the foam was adequate with the targeted zones of firmer cushioning. As far as support goes, I didn’t really feel anything extra but with the basic midfoot shank in place you should have enough there. The forefoot traction is excellent. The shoe employs a lot of herringbone (always a good thing) and the clear portion of the outsole sticks especially well, providing the traditional squeak even on dusty courts. Heel traction isn’t as big of a deal and again, I’m a midfoot striker, but the pattern on the heel is similar to Nike’s Blade setup. Being a relatively unknown brand and an overseas-based one at that, a lot of consumers are going to be interested in the materials used throughout the shoe. I’m happy to report that the materials feel very good overall. 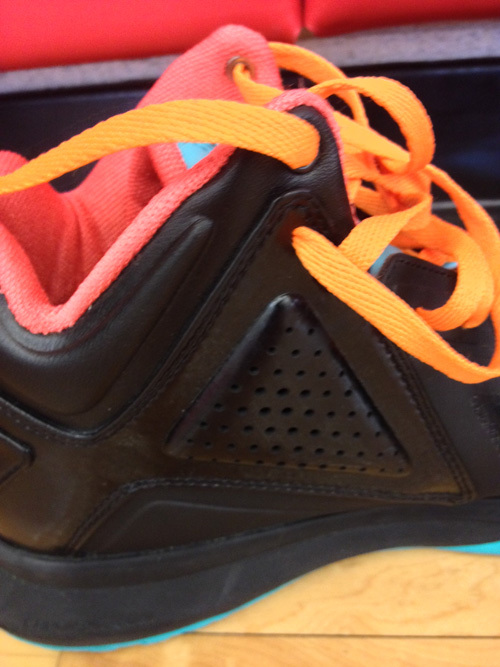 The synthetic fuse material feels nice overall and the synthetic leather panels feel great. Some portions of the sole on the heel are showing signs of the traction peeling, but this seems like something that was glued on the outer teal portions to increase longevity. None of the actual traction has worn down at all. I’m also getting some wear on my left toe, but keep in mind that I drag my left toe way too much. The shoe still seems extremely durable overall. At a retail of $120-$130, you really are getting good bang for your buck. Now, the question is where to find them. The “Fiesta” colorway is listed on peaksportsusa.com but only in sizes up to 10.5. I purchased mine through eBay seller 94feetofgreatness, who is officially licensed to sell from PEAK. PEAK’s U.S. website currently lists two physical stores in the States – one in Melrose, CA and the other in Culver City, CA – so our West Coast readers may be able to shed some light on the situation out there. Hey Max, great review, I’d very curious about how these are, but the issue without trying them on has got me a bit stumped on what size I should get. Depending on the shoe I’m an 11.5-12, I don’t have a narrow foot but am more flat footed. If you could, can you suggest some other models that have a similar/same fit. ie. Kobe 8/9, Jordan superfly 2, etc. Hi, could you do a review on the TP9? i was definitely interested in them, but I can never seem to find a size that’s wearable for a reasonable price. Dudes you gotta keep the reviews coming! You’re one of my favs! They’ll be coming – I’m getting married in a couple weeks and once all that is done I’ll have time to get back on em. Will probably be posting a bunch of reviews at once and get it going again. Hi guys i know this is a old review but i hope you can respond. Is there another shoe that you can compare these to? Is there another shoe that feels like this shoe? And are you gonna review the tp9-2 the sequel of this shoe? Anyways nice site and informative reviews.